For centuries, craftsmen, blacksmiths, and even scholars attempted to unlock the secret behind Damascus steel. It took John Verhoeven, a Materials Science Professor and Alfred Pendray, a master bladesmith to figure out exactly what made Damascus steel so legendary (Scientific American, Vol. 284, 2001). The secret turned out to be banded iron carbide particles. On a molecular level the steel must contain an impurity: Vanadium or Molybdenum. Small traces of these elements in high-carbon Damascus produce impeccable carbide bonds. The result is a hard cutting edge and rugged flexibility. The chemical composition of our Damascus features both elements, making for a superior and historically-accurate blade. We’ve worked hard to perfect our Damascus recipe and learned that it cannot be done by machine. It requires the skill of a veteran artisan, fire, steel, a hammer and lots of time. The knives are forged and shaped by hand with meticulous attention to detail and a deeply-rooted respect for the metallurgic art. Our Damascus is forged in-house from a proprietary four steel mix based on O1 and 52100. Most blades are 300-400 layers with a Rockwell hardness of 57-58 HRC. We call it High Carbon Vanadium Damascus, or H.C.V.D. for short. Our workshop thrives on specialization. 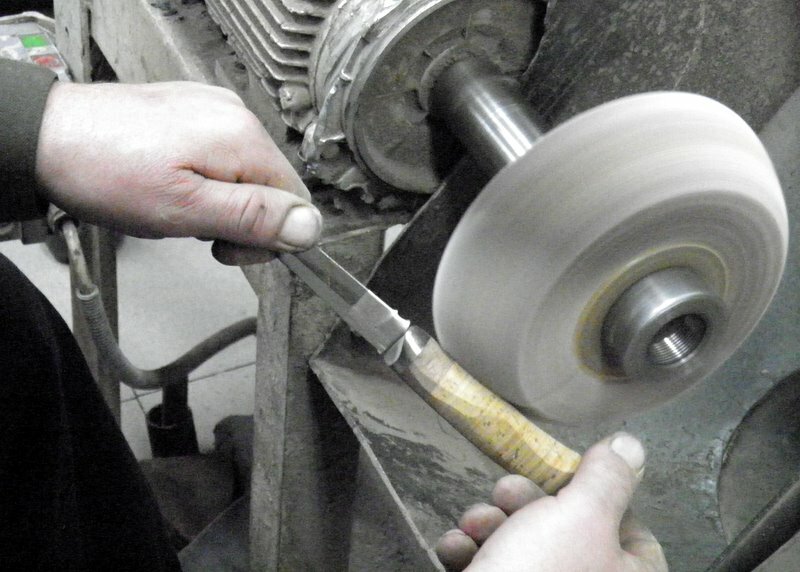 The creation of a knife is split into logical stages, each conducted by a specialist. Workers are trained in their respective areas: blade forging and shaping; heat-treatment and acid etching; final assembly and handle-work. This method ensures quality at every level and makes for impeccable fit and finish. We aim to create truly stunning pieces suitable for use or display.